16 oz. Medford Beer Glasses- customized with your branding. 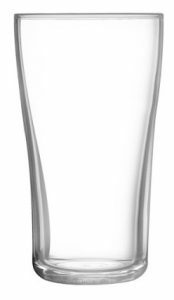 This unusual design will set off whatever you design to serve in it- the knurled 'handle' at the bottom of this Medford model bar glass showcases your latest brew or cocktail beautifully. These come 24 per case and hold 16 ounces. What's more, Deja Brew can work with you to put a custom logo- which we can help design- on every single piece you order, as well.